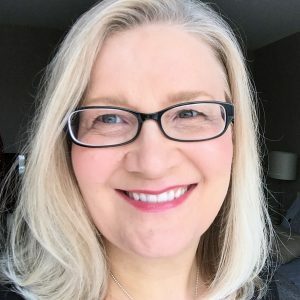 Hello everyone, Noreen Smith here today on the Creative Scrapbooker Magazine blog. Are you a fan of Travelers Notebooks, Bullet Journals, or other types of interactive journals? Then Creative Memories’ new Happy Album might be just right for you! 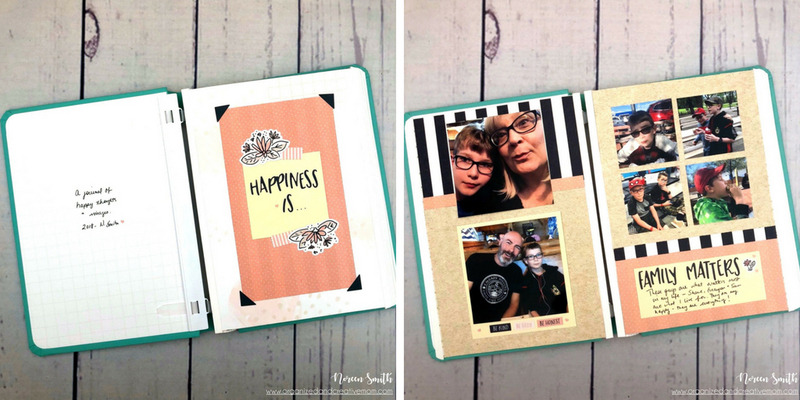 It’s the perfect way to share your happy with a fun new size, super Fast2Fab pre-designed pages and lots of cute papers & embellishments! 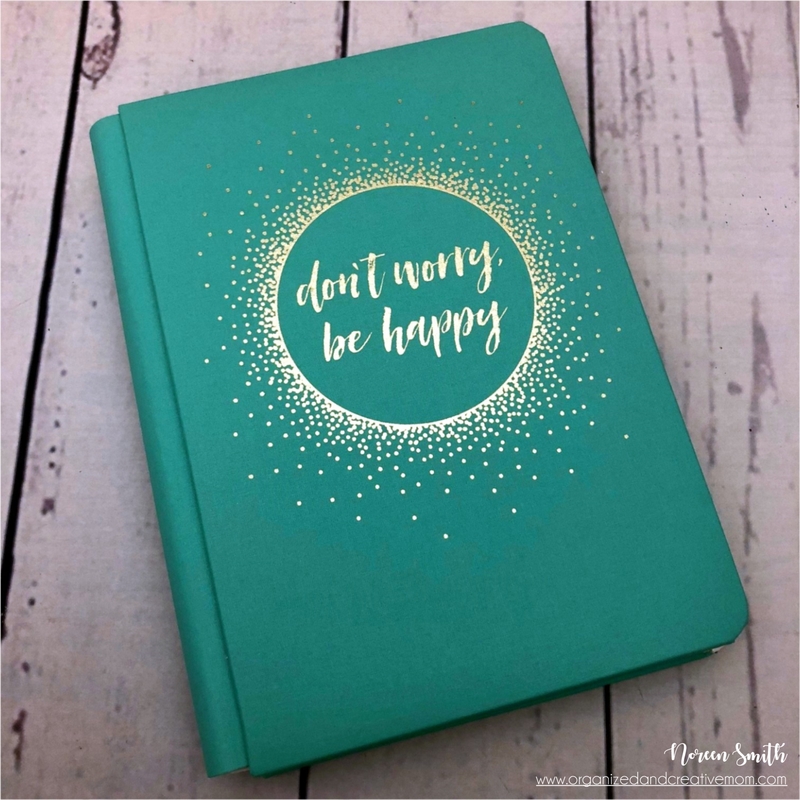 The Happy Album is a new size and format for Creative Memories and is great for people who might want a smaller, portable scrapbook they can take with them. Besides being portable, it doesn’t take up a lot of storage space and all the supplies can be kept right in the zippered case! 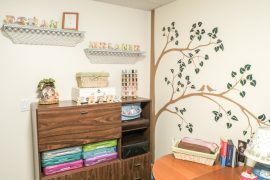 It’s also perfect for people who are new to scrapbooking, as all the necessary supplies come in the starter bundle, and ideas and inspiration for pages can be found right on the CM website. The blush, mint, taupe, gray, navy and olive tones in the pages and decorative accessories will work beautifully to document photos of all kinds of happy life moments and memories! I ordered the Happy Album Starter Bundle, which includes the beautiful Mint Green 6.75” x 10” Album Cover with Gold Foil design, 13 pre-designed Fast 2Fab Pages, Page Protectors, the GORGEOUS Vegan Leather Travel Case, Repositionable Taper Runner Adhesive, and a Black Dual-Tip for journaling, all packed in a cutest drawstring bag! It also comes with the first two Happy Album Kits which feature patterned papers, stickers, and fun embellishments – like washi tape! The starter bundle is a great deal – you can save a “bundle” with it, haha! – but you can also purchase the various components of the Happy Album separately. Once it arrived I was excited to dig right in, but I also wanted to give you a bit of an overview of the items in it. The Album Cover itself the same sturdy strap hinge design that all CM albums are famous for. The beautiful book cloth cover is easy to spot clean and has a limited lifetime warranty. It is expandable too, and you can add up to two more sets of refill pages to it and you can purchase more of the predesigned Fast2Fab refill pages or blank refill pages. The pre-designed pages come already loaded in the album so you can start scrapping right away! The Travel Case is a soft, vegan leather with a lovely floral pattern on it. Two interior pockets hold the album cover securely in place and a fashionable gold zipper encloses it completely to keep all the contents inside. An open pocket and another zippered pocket on the back will keep all the necessary album supplies conveniently at hand. Kits #1 and #2 come with the starter bundle and CM has said they will be releasing two new kits each month until December 2018. On the bottom of the title page for each kit, you’ll find a link to where you can watch a how-to video, and print out the instructions to create layouts using the materials in the kit. This is a great place to start, although you can create any type of layout you want! The Kits, Repositionable Tape Runner, Dual-Tip pen and your photos are all you need to get going! Like other Creative Memories albums, you can scrapbook right on the pages in the album or create layouts to add to the pages. I’m planning on mixing a little of both types of layouts in my Happy Album! I went ahead and created my first three pages based on the layouts featured in Kit #1 video and instructions, but used different papers and embellishments to make them a bit more personal. They were fast and easy to put together! Then because I liked the next pre-printed pages so much, I scrapped my photos and papers right onto them! Even easier! After finishing five pages, I still had lots of supplies leftover. I’ll keep them handy to use along with the other kits as they come out. 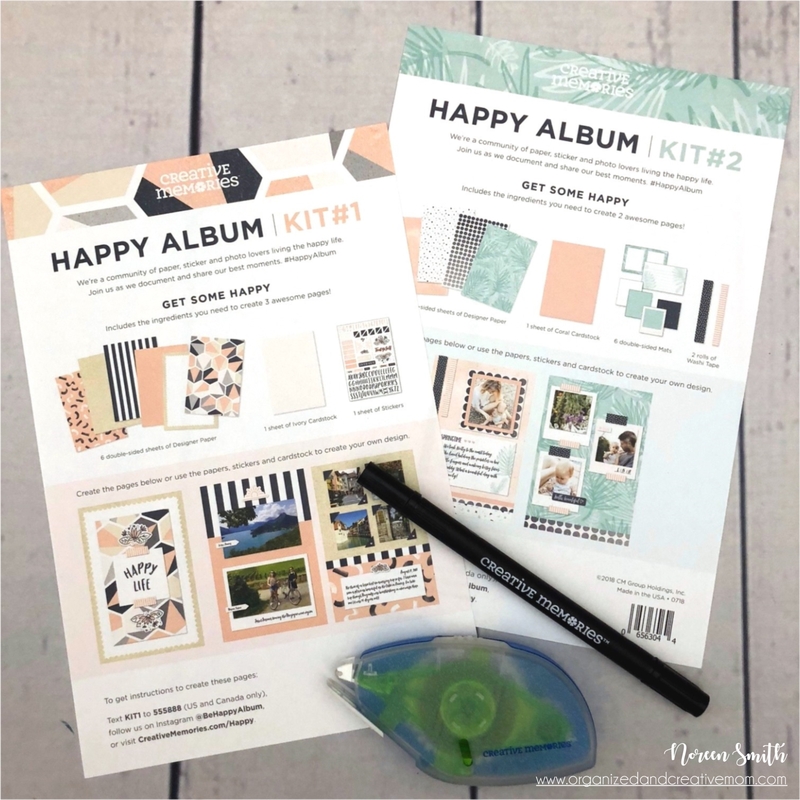 I’m looking forward to seeing what the new kits will be like each month and adding a few pages to my happy album! I think I will be using the album as a kind of diary or journal full of notes, quotes, and pictures that make me happy. What will you use your Happy Album for? We are THRILLED to announce that Creative Memories will be a sponsor for our 11th Annual Great Canadian Scrapbook Carnival. Registration starts August 1st for the Edmonton show and August 2nd for the Calgary show.